Very Early Georgian Farmhouse (c.1805) w/wood clapboard addition (c.1905) sits quietly and privately on 3.9 acres of pretty land! Great ceilings, handcrafted woodwork. This property has been in the same family since 1793 and is on the market for the first time. Foundations for barns exist near the main house allowing for adequate small animal habitat. 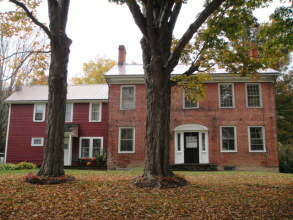 A wonderful property for a country gentleman or woman looking for an easy commute to Syracuse!